This entry was posted on Tuesday, August 30th, 2011 at 8:52 amand is filed under . You can follow any responses to this entry through the RSS 2.0 feed. You can leave a response, or trackback from your own site. This made me feel like floating…just like that feather. Reading your sweet words felt like a lullaby, beautiful. 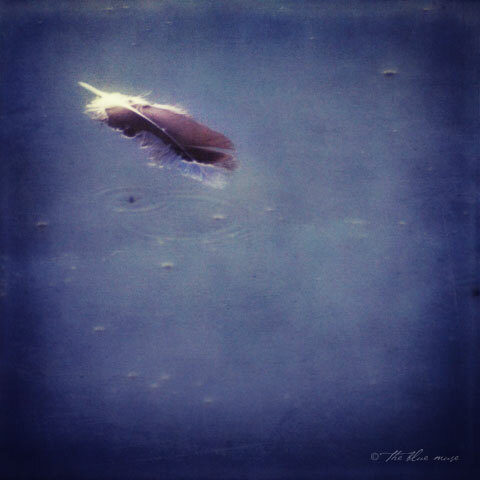 There’s something magical about a floating feather isn’t there? Magic of the night sky is sure felt in this piece, wonderful pic too. Great piece as always, really like the soothing feel to it. sounds peaceful and soul soothing…think i have to look for that place.. Thanks for the beautiful imagery…and the goosebumps! This is stunning! Im a fan! I wanna be where the loons and stars are reflecting and joking! Guess I’ll hop in the old hope jalopy and check the journey out. There are lots of “feel-good’ poems out here tonight. And I love them! Yours also, is one that instills into me an attitude of gratitude…for being allowed to partake in the nectar here in Dverse. thank you for being one of the chefs in this kitchen.–grin! complex, short and very well written.. great piece! What a beautiful decription of what sounds like a little bit of Heaven. Love the picture, too. It just adds to the beauty of the verse. Sounds like a nice place to be… filled with wonder. I can feel as if floating in these so sweet words. Very nice. Makes me pine for a mountain cabin we used to have, and the small lake nearby. No loons in SoCal, though — except the human kind! Your words are floating and this was so wonderful. Loved every precious word, like children you kiss goodnight, or puppies curled up on the bed, or babies that nuzzle while sleeping on your chest. Thank you! Oh, I love poems that are complete sentences! lovely words and photo .. they compliment one another perfectly. This calm lake could easily be the expanse of night sky we’re staring into, listening for truth from the infinite. We heard a truth in this piece, a soft, inviting, artistic truth. Beautiful. Hope . . . A proper place to reflect. I feel the buzz of circling around, looking for this place you know is there, you know is fine, is fun, maybe blue… But there’s room for your black ink too. Enjoy the ride, the process, the hope and the infinite places it takes you to… And keep on writing magical poems… It’s such a delight! Reading this was like drinking water, quenching, refreshing and a feeling of life that can’t quite be described as the cool travels down your throat. Lovely poem. A beautiful photo — matched by the beauty of the poem. blue dark” … I love/hate this place.